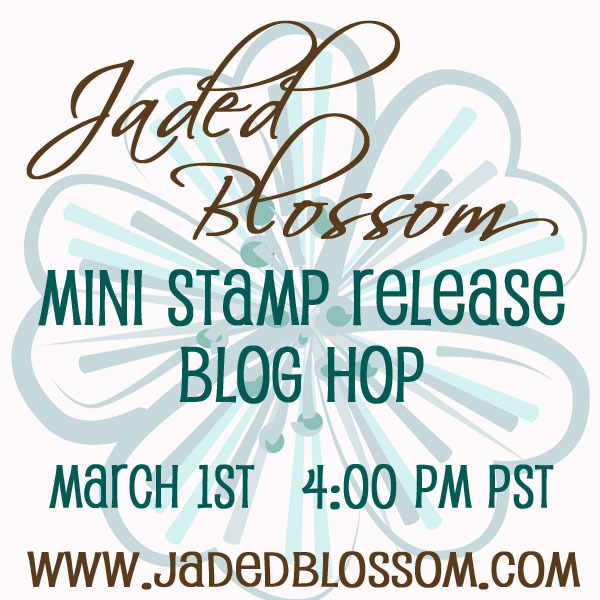 Jaded Blossom: Stamp Release Blog Hop! 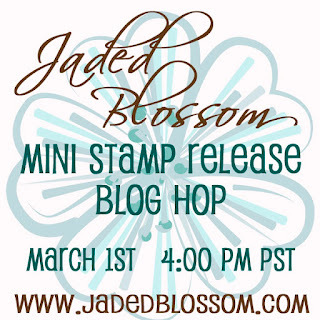 Hello and welcome to the Jaded Blossom Stamp Release Blog hop! We are very excited about what we have come up with for you!! In case you get lost along the way here is the order for the hop..
Abby <----- This months Guest Designer! First things first... we said this release was to DIE for right? Introducing... Flag Dies! You get two flags in this die set. The large one measures 5.75 inches long by 1 inch wide and has stitching around the edge. The smaller one measures 5 inches long by .75 inches wide. The small one sits perfectly inside the large one. We made these long like this so you can wrap them around a straw or a cupcake topper for example. You can also cut them and use them on cards, favors etc! These are thin metal dies and can be used in your die cutting machine (cuttlebug, big shot...) Use them the same way you use Spellbinders for example. This die set is $19.99. Now to make these dies better... we've created stamps that fit perfectly inside them! 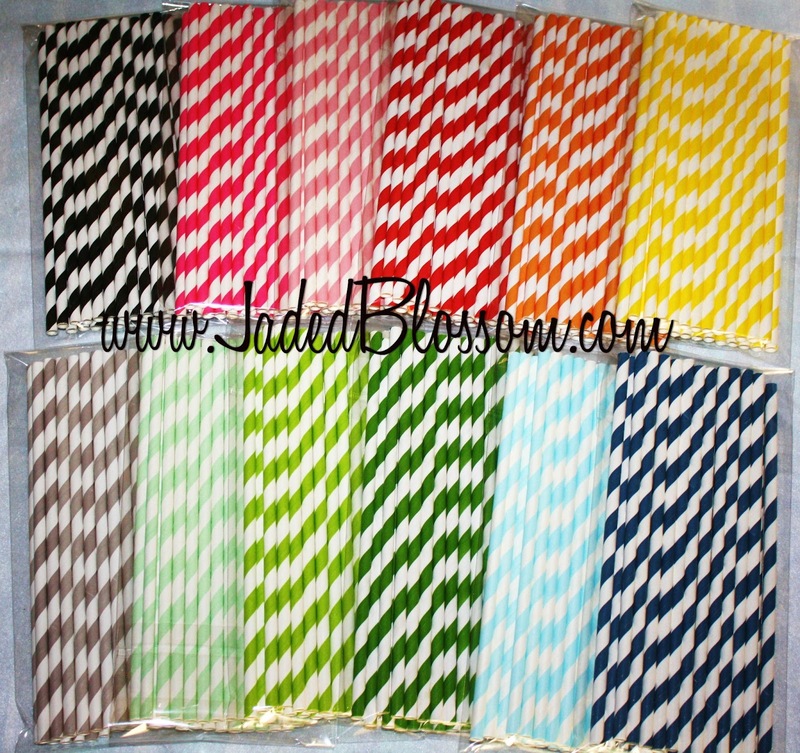 Also being added to the Jaded Blossom store are these fun straws!! Perfect to add some color and flair to any party. Use the dies to make your own flags that wrap around the straw (examples on the hop). 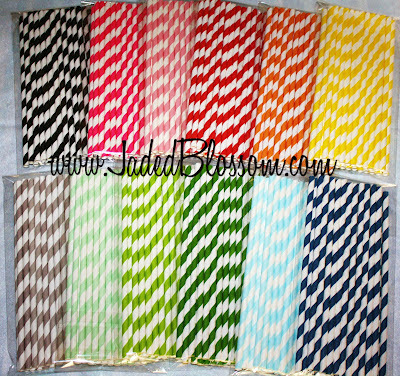 Straws available by color in quantities of 25 for $5.99. And of course whats a hop without some prizes? 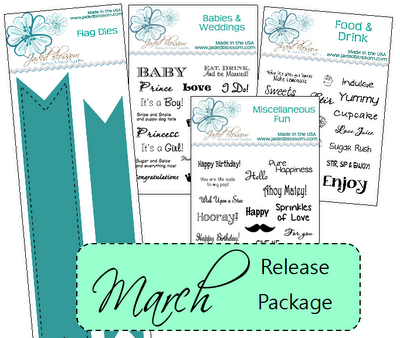 This month we are giving away Princess Party cricut cartridge and a 6x6 echo park paper stack! 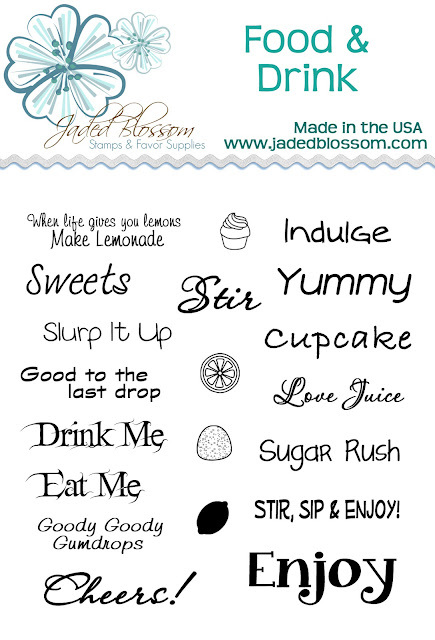 Make sure you are a follower of the Jaded Blossom blog and leave a comment. Also, you get an additional entry for each DT blog you comment on! And don't forget to come back on Sunday to see this month's challenge! Here is the blog hop order again.. next up is Candace! looks like a great line of products:) Im a new follower. Wonderful!!!!! I need to catch up here on my Stamps!!!!! Love the new dies. can see many uses with these. Cool... new people (artists) I like blog hops so I can see new ideas and what is going on in the world of papercraft and rubberstamping! All the new items are Awesome!!! !Especially the Flag Dies!!!! 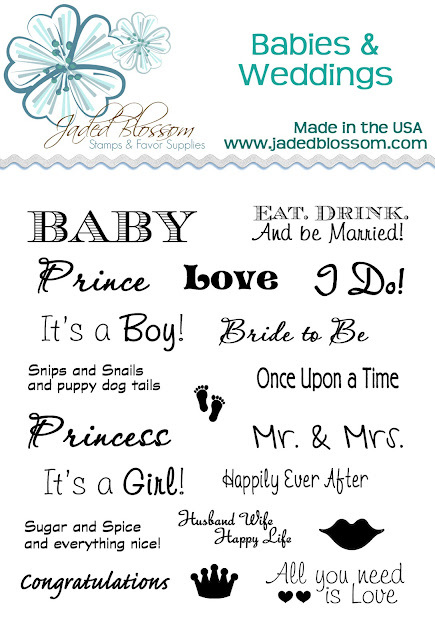 !My Favorite is Babies & Wedding. OMGosh! these are so cute. Cool stamps. Would love to have the babies and brides one!! This release is awesome, love every project on the hop, just finished it it was so much fun, thank you! Wow, this die/stamp release is awesome! I can think of so many ways to use this die! And I love the coordinating stamps too!! Very Cool! Terrific release/hop! Had to order the release! Will need those straws soon! Thanks for being so awesome! What a great hop. Loved all the projects. Great inspiration. 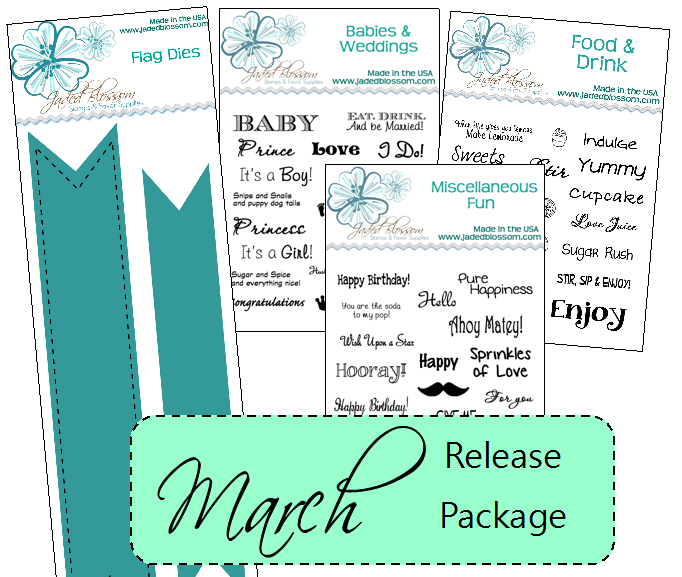 Wow, what an awesome release and blog hop!! Thanks for the chance to win..
Great release hop. Enjoyed it. I couldn't figure out how to leave her a comment, I liked her project. Wow! Just finished hopping!!! Love all the projects and I LOVE the new releases!! I'll be buying them ALL!!! What great dies and the stamps to go with them are just wonderful, thanks for the hop and the chance to win. 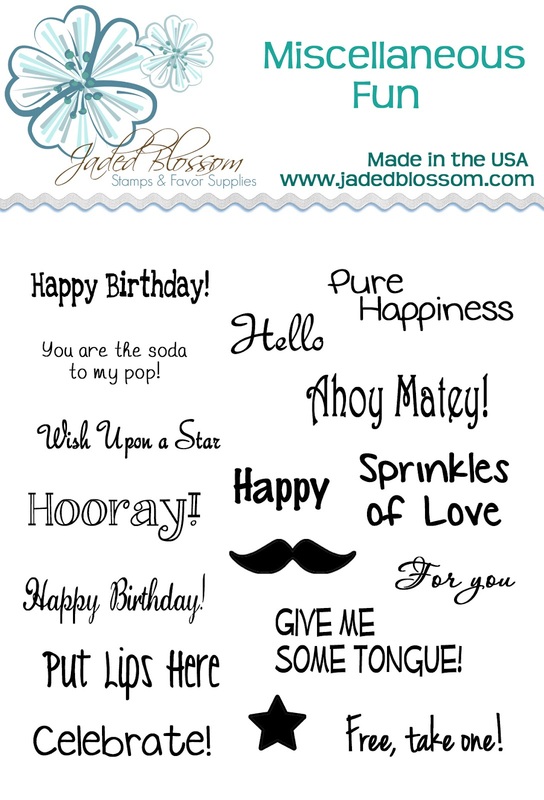 I just love sentiment stamps and yours have some great ones. Thanks for the chance at some cool prizes. Am already a follower. Great dies and super cute stamps!!! Thanks for the chance to win. Love the new stamps, and LOVE LOVE LOVE the straws!! I was looking for colored straws two weeks ago for a baby shower. GREAT IDEA!!! very cool, these are really cute. Great new products - now I am off to hop! Another GREAT release!!! Love the colors of the straws and the die.. AWESOME!!! I just love all these products you have come up with. Your blog is super awesom. What a great job you ladies are doing...thank you! And, of course, I am a follower of your blog. Love these new sets! You are doing a great job on your stamps and the blog is beautiful! Love the sets!!! Great products!! Fabulous new blog - love the colors. Your mini release is awesome love the dies and the stamp sets especially Food & Drink. I love the new die and the new stamps that go with them! Your blog is awesome! Another great stamp release! Love how you are branching out and adding dies too! Great job girls! I just found your blog! I'm a new follower now! Thanks for the opportunity! Off to hop...! I'm a new follower! I love those straws,just used the black and white ones for my daughter's b-day, they are so cute! The flags would have been so cute on them! Congrats on your new release. Love the new set! and a great hop! Your DT did a great job. LOVE the flag die. Thank you for a nice blog hop! Love the Flag/Banner die. Looks like you guys are off and running! love all the ideas.. the straws are a great addition! may have to have all of these cute stamps! I love those dies and stamps. Thanks for sharing them. I need those straws! As always what a great new release. Love every bit of it. Love all the new releases!! Great stamps and die!! love the straw idea!